Freshwater Fisheries is planning to start a new smallmouth bass supplemental stocking program in sections of the upper Potomac River that have been experiencing recent low levels of juvenile fish recruitment. 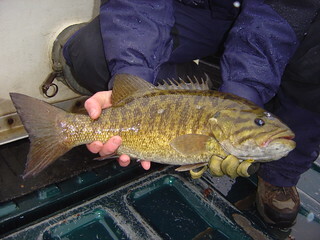 If you are interested in seeing more information on the project plan, would like to provide comments, or have questions, please go to the smallmouth bass stocking webpage​. Manage Maryland's freshwater resources using scientifically valid, standardized assessments and management techniques to provide high quality, diverse, and accessible fisheries for Maryland residents and visitors. ​Please CLICK on a region for specific information, or contact headquarters in Annapolis with general questions by calling 1-877-620-8367.
maintenance and creation of public access. Freshwater fisheries management focuses on: largemouth and smallmouth bass, sunfish, crappie (white and black), channel catfish, chain pickerel (pike), muskellunge/tiger muskie, northern pike, walleye, and trout. Invasive species management primarily includes minimizing impacts of blue catfish, flathead catfish, and northern snakehead. Management strategies are based on a populations' age and size structure, reproductive success, and habitat and environmental conditions. Typically, freshwater fisheries are managed according to geographic areas. Management of Maryland's freshwater fisheries is divided into 5 regions, the tidal black bass program, and the brook trout program​.